Approximate particle boards (OSB, OSB, OSB) is a multilayer board material obtained by pressing wood chips mixed with adhesive mass. The durability of the structures assembled from OSB directly depends on the correct choice of a slab with the desired characteristics. In order to choose the right material that will best cope with the functions assigned to it in certain operating conditions, it is necessary to understand what types of OSB of plates, their brands and scope of application, as well as what sizes of sheet OSB exist for different manufacturers of this material. Manufacturers of oriental chipboard produce their products in accordance with the standards of the EU or US certification system. Those manufacturers who work in the Russian market, in the majority, certify their products according to European standards. There is also the Russian GOST R 56309-2014, which regulates the characteristics of the GSP, but it is designed to meet the European regional standard EN 300: 2006. 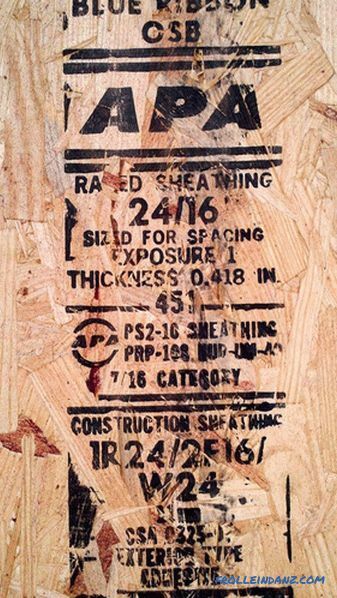 Therefore, OSB manufactured according to GOST R 56309-2014 and EN 300: 2006 have the same labeling. EN 300. 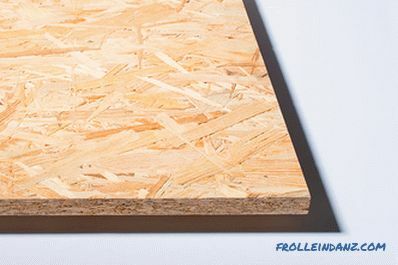 "Oriented - chipboard (OSB): Definitions, classification and specifications "
EN 13986." Timber for construction. Characteristics, conformity assessment and marking "
The most common is EN standard 300. Its criteria include the abrasion resistance of the face surfaces, the bending strength of the slab, the ability to interact with the coatings and the ability to hold the fasteners. The fundamental characteristics affecting the class of material is the spatial strength and moisture resistance of the plate. OSB-1. Panels for the construction of unloaded structures and operation in dry conditions. OSB-2. Plates load-bearing for use in dry environments. OSB-3. Universal load bearing panels for use in wet conditions. OSB-4. Plates for high-loaded structures and applications in wet conditions. It should be borne in mind that, according to European standards, a dry environment means that the humidity level at a temperature of + 20˚C can exceed the threshold of 65% only by a few weeks a year. Under the wet environment means that the level of humidity for only a few weeks a year can exceed 85% at an ambient temperature of + 20˚C. Taking into account these parameters, OSB-1 is allowed for unloaded operation in rooms where the air humidity does not exceed 20%. The arrangement with OSB-2 plates is permissible in semi-dry environments without loads. OSB-3 is considered a versatile material for structures in medium humidity and stress environments. 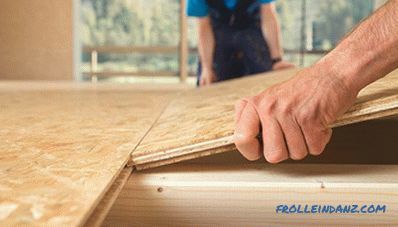 OSB-4 are technological materials for the construction of supporting structures for long-term use in wet environments. These types of OSB plates provide an extensive selection of materials for a variety of needs, from assembling packing boxes to building elements of buildings. Sometimes you can find OSB produced by North American firms in Russian outlets. These plates have their own labeling, different from the European. 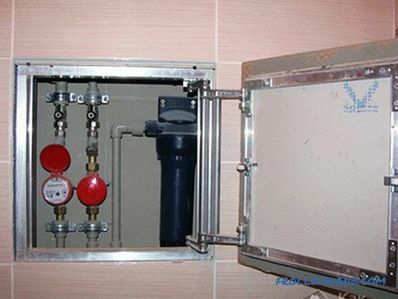 It is very important not to make a mistake and choose exactly the plate that is suitable for operation in specific conditions. PS 2. "Quality standard for building panels based on wood"
By load bearing properties, degree of swelling, resistance to loads under conditions of different humidity and a number of other parameters these two standards are the same. Therefore, many manufacturers produce products corresponding to two standards at once. 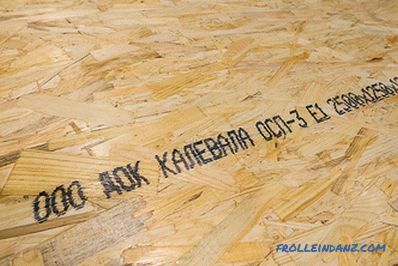 North American manufacturers, for defining OSB grades, do not use grades that speak about the characteristics of the plate, but marking that indicates the purpose of the material. The buyer only needs to choose a sheet of the appropriate thickness. 2R - sheets for the formation of a continuous roof lathing with the arrangement of support at the edges of the structure. 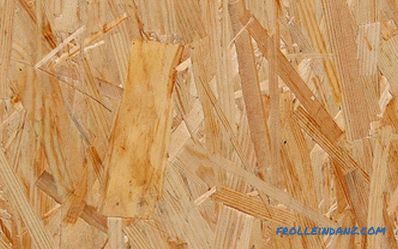 As a rule, the OSB of the same configuration belongs to several brands of particle board, therefore marking of sheets contains marks of several categories at once, for example, 2F16 / W24 / 1R24. This means that it is permissible to use flooring and roofing materials, as well as wall cladding. The numbers in the label indicate the maximum allowable distance between the supports of the frame structure, taking into account the dimensions of the sheet. This distance is indicated in inches. On the panels of some manufacturers there are lines for marking the joints of fasteners and batten racks. In order to understand the conditions in which this or that plate can be used, it is necessary to look for special inscriptions in the marking: Interior, Esposure Type Binder, Exterior Bond. 1. Interior. Materials for interior decoration and operation in dry conditions. 2. Esposure Type Binder. Construction plates capable of withstanding moisture. Can be used for outdoor work after treatment with protective coatings. They are used at a humidity of less than 19%. 3. Exterior Bond. Sheets suitable for use in conditions of repetitive wetting and drying, as well as prolonged exposure to adverse weather or soil. Can be used in environments with absolute humidity over 19%. The quality characteristics of products from different manufacturers, marked according to EU and US standards, are in many ways similar. For example, the characteristics of the brand OSB-2 coincide with the characteristics of Interior, OSB-3 - with Exposure, and OSB-4 - Exterior. The main difference lies in the raw materials used for the manufacture of plates. 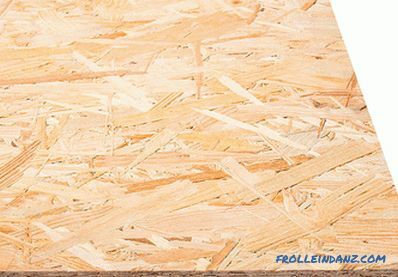 European OSB produced from coniferous wood. American and Canadian manufacturers mainly use poplar. Depending on the purpose of the material, OSB may have different surface finish and sheet edge. Untreated sheets with a rough surface, providing improved adhesion to bituminous coatings. Such panels are an excellent base for bitumen primers and roofing decks, which ensured their demand for the formation of a continuous cracking of roofs of any area. Machined sheets intended for the construction of structures with tight thickness tolerances. Sheets of this type of OSB are coated with liquid or pasty varnish on one side. LKM is applied using roller plants or laconing machines. This technique allows you to get a monotonous transparent or embossed patterned coating. 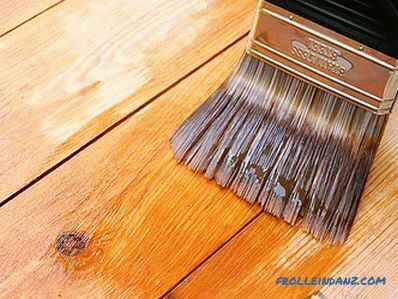 Pretreatment of the base with primer or putty can reduce the consumption of varnish, as well as pigment the base in accordance with the pursued decorative goals. Lamination is understood as the coating of OSB on a surface with adhesive compositions of paper. As a rule, for these purposes, melamine-containing resins are used, which in the process of hot pressing, set to the base and harden to the state of a thermosetting polymer. Excess emulsion is distributed over the surface of the panel with rolling sheets of a press, due to which the outer layer of the sheet acquires the necessary smoothness or relief (embossing). Panels with smooth edges are used in rough construction and container manufacturing. Plates with ends, having the shape of a groove-tongue joint, are in demand in facing a large area. Such materials provide effective thermal insulation and tight connection in the joints of adjacent sheets. 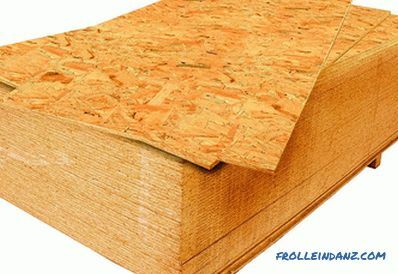 The standard dimensions of the OSB sheet are: 1250 * 2500 mm. by European standards and 1220 * 2440 mm. by North American standards. Sometimes on sale can be found plates of 3000 and 3150 mm. Some manufacturers, under the order, produce plates of greater length, up to 7 meters. 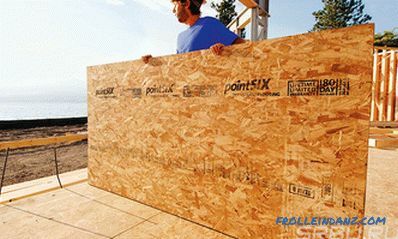 When choosing the size of OSB boards, it is best to prefer larger sheets. Selecting larger sheets, you will get fewer joints after their installation. This is very important when covering some designs. As an example, you can take the trim of the walls of the frame house. 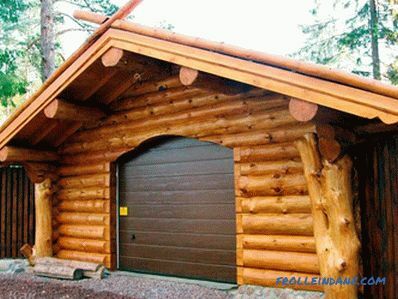 In this case, it is very important that one plate covers the entire height, from the bottom to the upper floor or roof. On the domestic market, approximate chip boards are represented by products of Russian and European companies, among which the most recognizable brands: Kronospan (Belarus, Mogilev), DOK "Kalevala" (Russian Federation, Karelia), GLUNZ (Germany), EGGER (Romania) and Ultralam (Torzhok, Russian Federation). Kronospan is an Austrian manufacturer of wood-based materials with an extensive network of factories around the world, including Belarus. The OSB of the Mogilev enterprise meets European standards, but at the same time it has an affordable price. Excellent operational characteristics and increased moisture resistance made OSB of the Kronospan brand one of the leaders in sales of the Russian building materials market. DOK "Kalevala" is the largest manufacturer of wood-based panels in Russia. 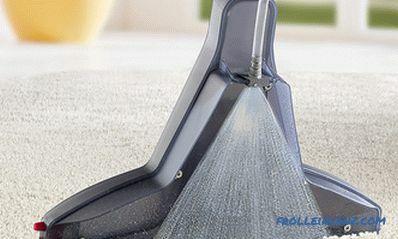 The company introduced the latest technology, which allowed to produce high-quality and environmentally friendly products that meet the highest safety standards. Thanks to these features, OSB from DOK Kalevala gained popularity not only in the Russian Federation, but also in the CIS countries. 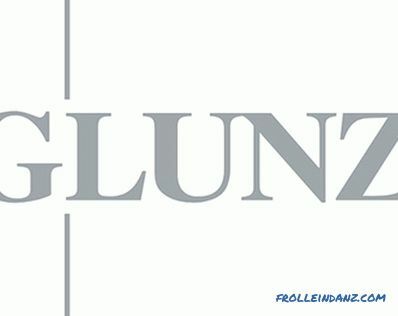 The German brand GLUNZ, by right, is considered the flagship of the approximately-chipboard industry. A feature of the manufacturer is the use of high quality timber and environmentally friendly adhesives. The company produces OSB-3 with formaldehyde emission level E0. This makes GLONZ PSPs absolutely safe. A European brand whose products are considered to be the reference sample of high quality at an unusually low price. OSB of this brand, issued by a Romanian company, have good density, perfect geometry and low hygroscopicity, which makes them indispensable in the construction and manufacture of furniture. The manufacturer produces plates of environmental standard E1 and E0. If you need an affordable and reliable OSB cooker, the dimensions of which will satisfy the needs of any construction, pay attention to the production of Ultralam from the Russian manufacturer Taleon Terra whose production facilities are located in the town of Trazhok, Tver Region. This is one of the most technologically advanced and modern plants not only on the scale of the Russian Federation, but also of the EU. Production of plates produced by continuous pressing. The plates have an ideal geometry and high density (from 620 kg / cubic meter), which is especially appreciated in the construction of frame houses and the manufacture of CIP panels.